The Romeo y Julieta No.2 is a complex and smooth medium-bodied Habano Petit Corona, 5.1” (129mm) long, of 42 ring gauge, and comes in aluminum tubes in a 10 cigars box. 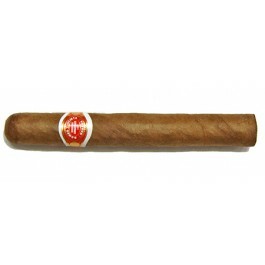 The Romeo y Julieta No.2 is a smooth medium-bodied Petit Corona, 5’1” (129mm) long, of 42 ring gauge, and comes in aluminum tubes in a 25 cigars box. It similar to the Petit Coronas from the same brand, and full of flavors. It has obviously some familiarity with the other Marevas from Romeo y Julieta. It reveals some earthy, woody aromas, and also a good amount of leather and some hints of spice on the tongue. The construction is wonderful, it is a beautiful hand rolled stogie, and the packaging, the magnificent aluminum tube, makes it a cigar that every cigar enthusiast should have in his humidor. Very good everyday cigar. Good quality for its price. • Smooth and lots of flavors despite its small ring gauge. • Aromas typical of Romeo y Julieta, of earth, coffee and leather and nice spicy note on the finish. Perfect as a morning cigar. The tube that comes with it is beautiful. The cigar has a beautiful construction, an almost perfect wrapper. It has a nice even color. It cuts very easily and the first draw at cold reveals robust aromas with lots of complexity. There are rich earthy flavors, as well as some sweetness that is reminiscent of cocoa, vanilla and also some notes of coffee. The pre-light draw is good, while a bit tight at the beginning, but tends to loosen once lit. Due to its amazing construction, the dark grey ash can build up to a nice length of one inch or so. The burn line is a bit wavy at first but soon corrects itself and nice thin rings appear harmoniously. Every draw produces a generous cloud of smoke, despite being a small ring sized cigar. In the first third, the cigar starts off with pleasant notes of chocolate, cedar and nuts. The flavor profile of this cigar is ideal for a morning cigar, not very strong, with just a bit of sweetness. There is a nice little spicy finish on the tongue. Into the second third, the cigar keeps on the same tone of flavors, but the spicy edge fades away, and the cigar becomes smoother. Soon, more complexity comes as well and reveals some more salty aromas, of leather, which is much welcome. The draw is now perfect and each puff generates a good amount of smoke. In the last third, the flavor profile remains similar. However, a kick in nicotine comes and now the cigar becomes a bit stronger, closer to a medium bodied-cigar. The cigar reveals more complexity as well, adding aromas of salt and mint to the ones of leather. In summary, it is an excellent cigar for its price. It is a perfect morning cigar, for a short break, thanks to its smooth flavor and its medium body. Also its beautiful tube is a keepsake for any aficionado, which makes this cigar a nice gift.